Bitcoin’s popularity continues to soar, along with the opportunities it offers retail investors. Even so, purchasing bitcoin can be difficult for many traders, as many exchanges and other websites have drawn-out and complicated procedures or limitations as to how bitcoin can be purchased. 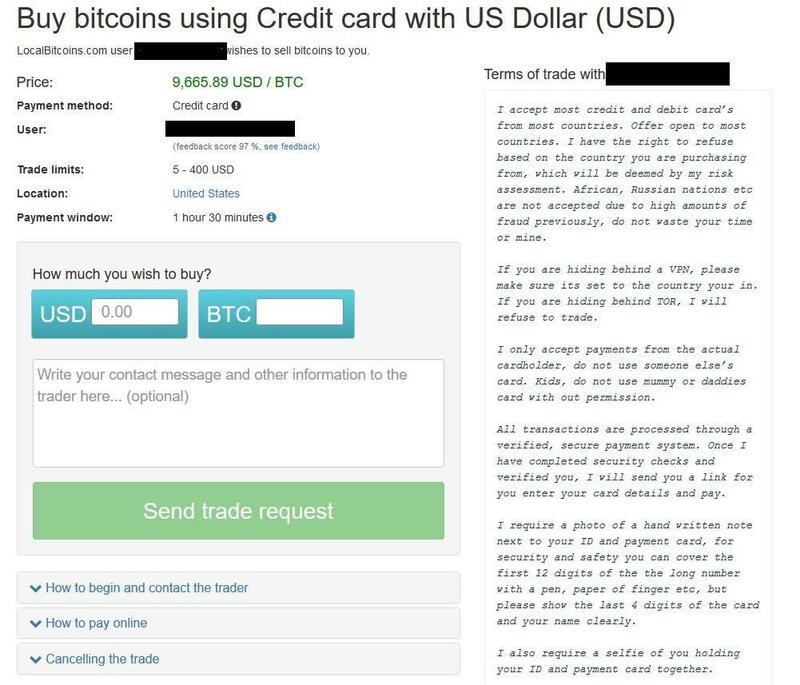 However, many exchanges have now found a way to provide their traders with an easy solution, enabling clients to purchase bitcoin directly with a credit or debit card. With the price of bitcoin still numbering in the thousands of dollars, the possibility of generating investment returns continues to appeal to many prospective investors. Using a credit card can help you enter the market and gain exposure to one of the more novel asset classes in recent memory, but you should always be careful. These are some of the most popular and well-reviewed websites where you can purchase bitcoin with a debit or credit card. With a reputation for being one of the most regulator-friendly and trusted cryptocurrency exchanges in several countries, Coinbase delivers a combination of speedy services and reliability when buying bitcoin with your credit or debit card. The company’s two platforms—Coinbase Pro and Coinbase.com—offer differing degrees of access to the more popular cryptocurrencies. 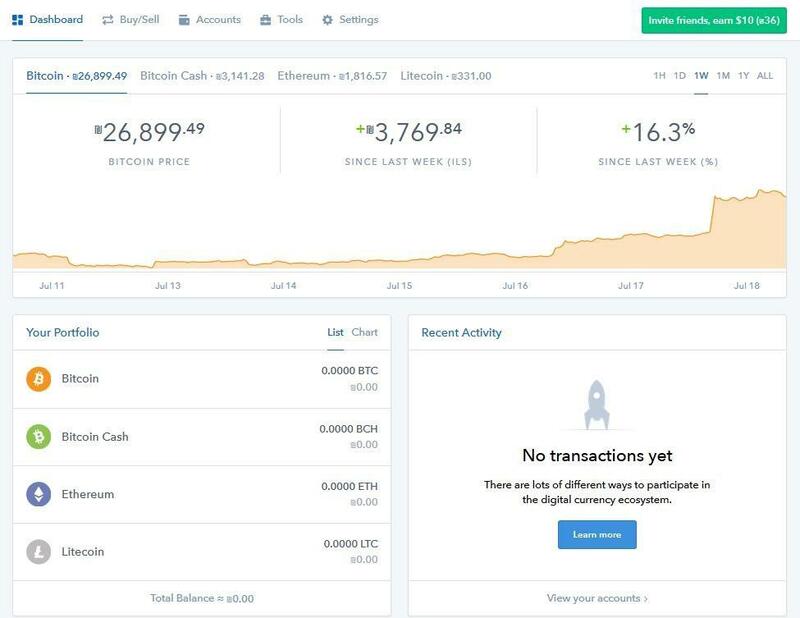 On Coinbase.com, retail traders who have been verified can purchase Bitcoin, along with a few of the most popular cryptocurrencies, using a credit or debit card. However, it’s important to note that this functionality is not available to new users, as the company recently changed its policies on the matter. Even so, users who were verified prior to the rules changes can still use their cards to make purchases. If you are looking to hold large volumes, you can also take advantage of the company’s Coinbase Custody platform. 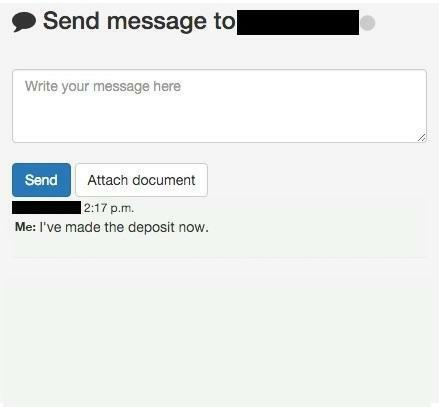 The first step towards purchasing Bitcoin through Coinbase is a simple email verification, and a code sent to your mobile phone. After you’ve input your details and completed your registration, you’ll be able to access your dashboard and keep track of the cryptocurrencies Coinbase lists (Bitcoin, Bitcoin Cash, Ethereum, and Litecoin), as well as your portfolio and transaction history. To purchase Bitcoin, simply head to the Buy/Sell menu, which includes the different options for payment. Once you select Bitcoin from the menu, you can choose to pay with any of the cards you have linked and verified through Coinbase. While it’s not an instant purchase, it is close, with minimal waiting times thanks to credit card payments. If you haven’t verified your credit or debit card before purchasing, you’ll be prompted to complete the process. 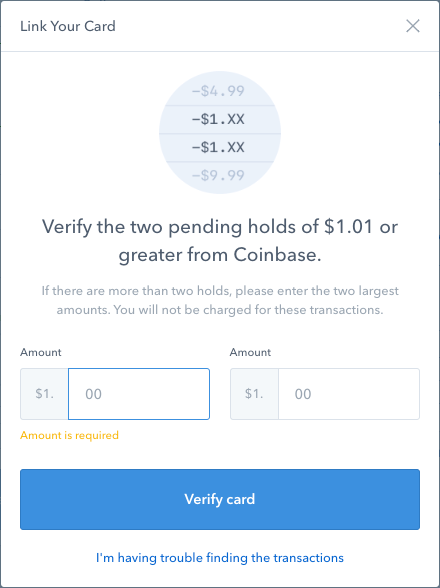 Once you’ve filled in your card details, Coinbase will make three small charges in fiat (roughly $1) which must be confirmed. At the verification screen, you will have to enter the exact amounts charged to complete the process. 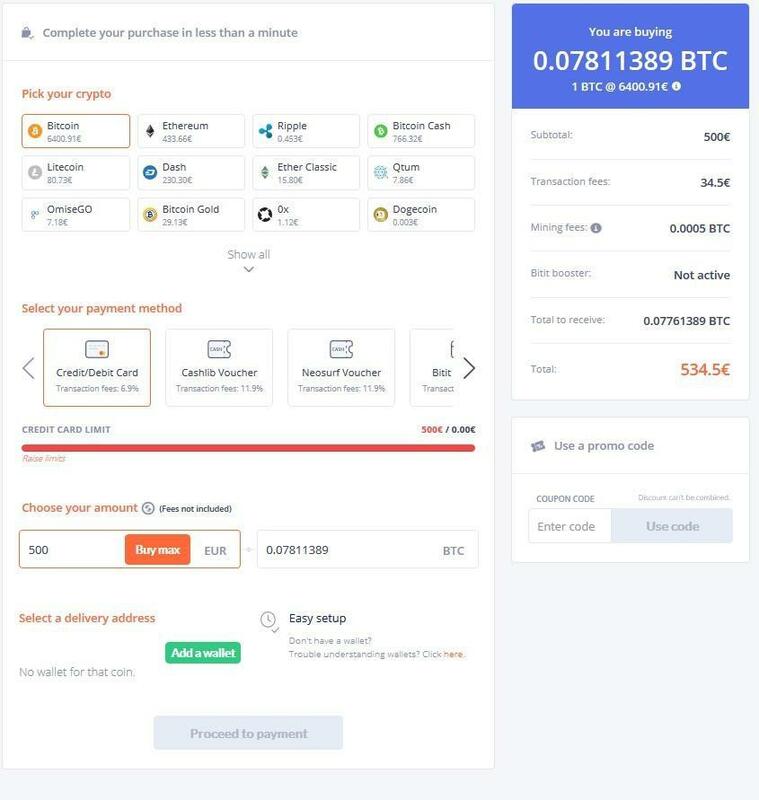 With your card in the system, the next step is to choose Bitcoin from the Buy/Sell screen, select your card, and choose the amount to purchase. The exchange does place a limit on both purchases ($7,500 weekly) and withdrawals ($100,000 weekly), but it places few other restrictions on how you can purchase, move, or trade your assets. You can also choose to set up automated purchases at daily, weekly, monthly, or bi-monthly intervals. Coinbase does charge a fee for any purchases, and they are usually around 3.50%. Unlike the previous options, LocalBitcoins is not an exchange, but rather a P2P network where users can buy and sell Bitcoin easily. The company, based out of Finland, is simply an intermediary for users to trade tokens, so the company itself does not hold any coins. Another unique feature LocalBitcoins offers is that the platform does not sell coins at their market value, but rather at the price other users are willing to part with their Bitcoin. 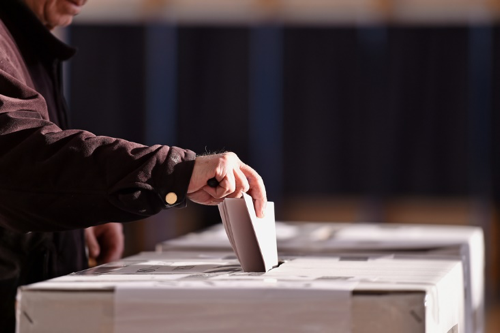 Users can both sell and purchase coins, and LocalBitcoins operates as an arbiter in case of any disputes. More importantly, funds are held in escrow until users and transactions can be verified, adding to the website’s security. With coverage available in over 248, LocalBitcoins presents one of the more effective ways to buy Bitcoins with a credit card. LocalBitcoins also has one of the easier registration processes as it’s not an exchange and so not subject to many of the same regulations. 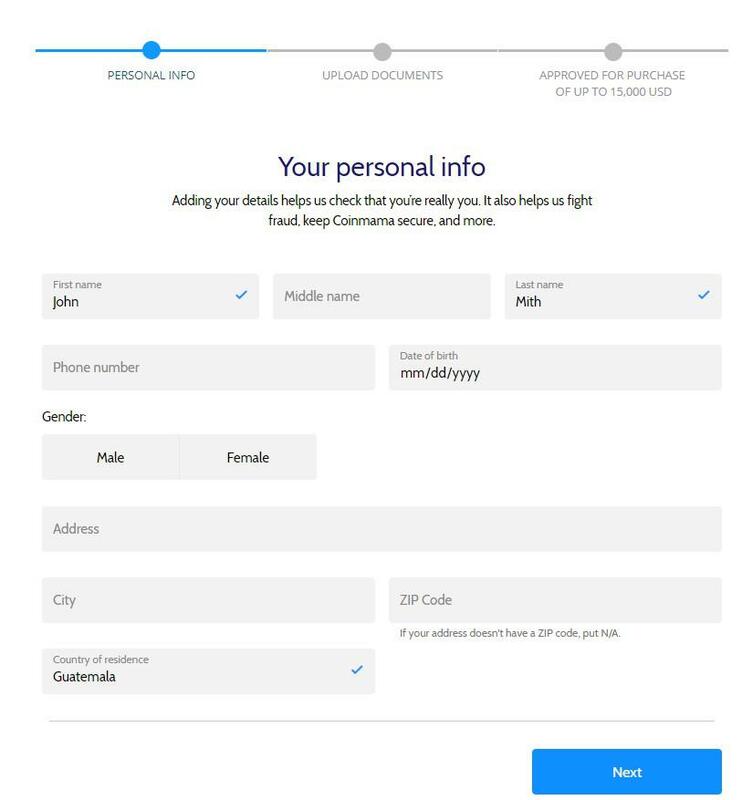 After entering basic details including your name and email, along with a user name and password, you verify your account with an email link, and are ready to start using the platform. Making purchases through LocalBitcoins involves some searching to find your preferred price point as well as some luck. To make a quick purchase, you can simply scan through the existing listings and negotiate directly with the person who made the posting. Alternatively, you can do a quick search using the website’s quick buy tool bar, which lets you list the amount, fiat currency, country, and payment method. Once you choose the offer to complete, you make a request to the trader for the specific amount of Bitcoin you would like to purchase, and if approved, you will be sent specific instructions on how to pay. To receive your coins, you must complete the payment request and notify the seller that the funds have been transferred, thus releasing your Bitcoin. 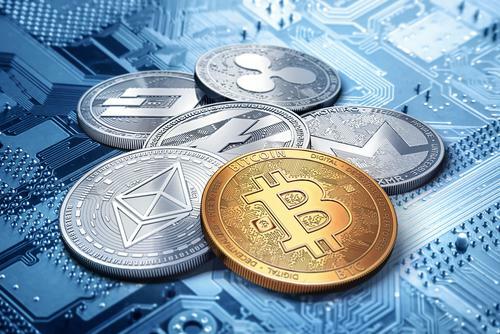 The system is not as efficient as those on more established exchanges, but it does offer users who may not be approved or fully verified to gain exposure to cryptocurrencies. The company also doesn’t charge fees for buying and selling coins though they do include a 1.00% fee for advertisers when a trade is completed. This also doesn’t count any specific fees your credit card provider may charge. A smaller and newer entrant into the field, France-based Bitit offers a quick and easy approach to purchase Bitcoin and other cryptocurrencies with a credit or debit card. The company accepts Visa and Mastercard as well as American Express and Maestro. 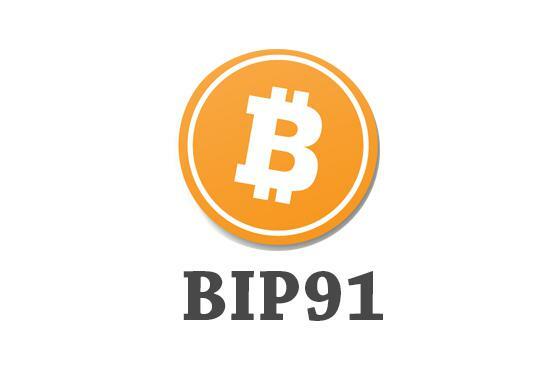 One of the useful features Bitit provides is the ability to purchase cryptocurrencies in a variety of fiat currencies including the most popular ones (USD, EUR, GBP). The company is also regulated in France and offers real-time transactions to reduce traders’ exposure to market volatility. In addition, users can sign up from anywhere in the world, without any restrictions. The company advertises a quick and painless registration process, and they largely deliver. Getting started takes a few seconds and includes filling out a quick form before choosing a user name and password. Once registered, you can start trading and purchasing Bitcoin immediately, or you can complete the verification process to remove any caps on purchases. To make a purchase, simply click “Buy” and pick the cryptocurrency you wish to purchase. After selecting the payment method and choosing your amount in fiat, enter the wallet address where you wish to deposit your funds in. Overall, the process takes a few minutes before you can start using your coins as you wish. Bitit does have some of the higher transaction fees of the companies reviewed though not by much. Transactions made with a credit card have a 6.90% fee attached, not including any fees on the processor’s side. The London-based CEX.IO accepts customers and traders from nearly every country on earth. Even so, some areas (like the Middle East and Africa) may have to resort to lengthier payment options, as credit card purchases are restricted in the regions. This is not a blanket ban, but several countries such as Qatar, Saudi Arabia, Yemen, Oman, Nigeria, Iraq, and even Iceland, which is in Europe, are affected. In the US, CEX.IO is only available in 24 states. Regardless, CEX.IO has a formidable reputation for security and it also offers a clean and easy-to-use interface that helps users get acclimated while providing advanced trading tools. Signing up for CEX.IO requires a valid email, or an active Google or Facebook account. 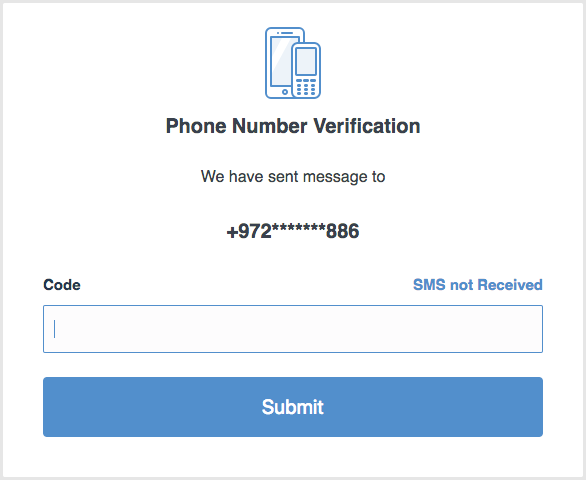 Once verified, CEX.IO sends a code via SMS to your phone to finish the registration process. The company also helps users bolster their account security with 2-factor authentication, though it’s not required (the company highly recommends activating it, however). To be able to use your credit or debit card, you must also verify it first, a process that takes between two to three days to complete. 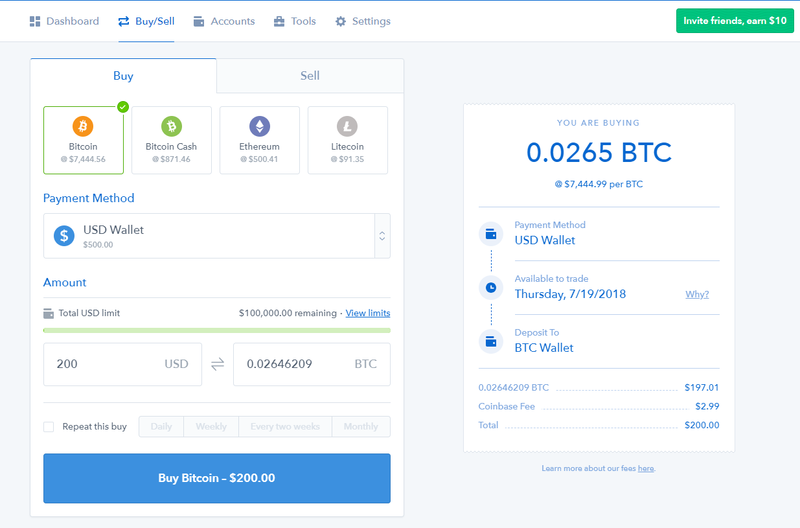 Once ready, you can visit CEX.IO’s buy/sell page and choose the BTC option from the drop-down menu (as well as your fiat currency for payment) before selecting how much you would like to purchase. CEX.IO does place some restrictions on purchases, with $1,000 for daily purchases and $3,000 for Basic members. Verified accounts, however, can make unlimited deposits and withdrawals. The company also offers standard fees for the industry, with a processing fee of 3.50% for deposits and up to $3.80 on withdrawals, depending on the fiat currency used. Fortunately, CEX.IO offers payments in a variety of fiat currencies, including Dollars, Rubles, Euros, and British Pounds. The company also allows for purchases on both Mastercard and Visa. With over 200,000 customers and a good selection of available cryptocurrencies, Coinmama has become one of the more popular hubs for users looking to quickly and easily purchase bitcoin. The company offers its services globally (though with some exceptions) and has a strong reputation for security. The platform does not offer exchange services, but rather fulfills customers’ orders from their own holdings. Users can pay with both Visa and Mastercard as well as with bank transfers. 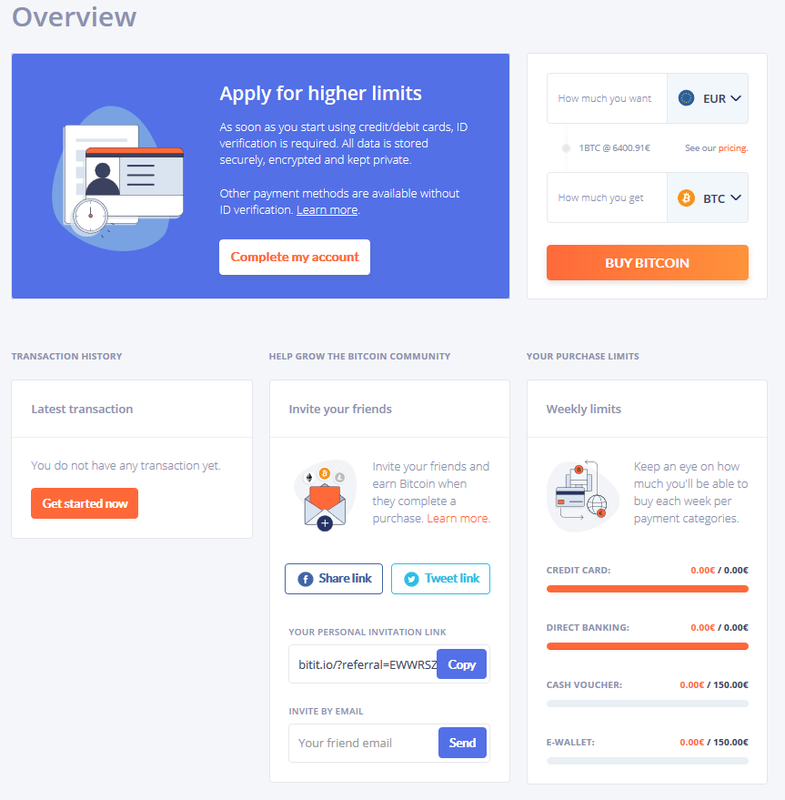 Although the company’s fees are somewhat higher than other bitcoin purchasing options, Coinmama stands out for its secure platform and for its ease of use. Regions Supported: 180 countries worldwide including Europe, 26 States in the US, large areas of Africa and Asia, with some local exceptions. To make purchases, you’ll need to create an account and get verified. However, the process takes only a few seconds and is straightforward. To get started, simply press the “Sign Up” button on the homepage, and fill out the details requested, including your email, name, and country of residence. Once you complete this initial step, you’ll have to verify your email account, after which you’ll be able to log in to your account. To complete your registration and be able to purchase bitcoins, you’ll need to complete the final step of initial verification. You’ll be asked to provide some more personal information, as well as a picture of an official photo ID and a selfie of you holding your ID. Once completed, you’ll be approved for purchases up to $15,000. When you’ve finished your application and verification process, you’ll be able to start purchasing bitcoin. To buy coins, press “Buy” at the top of the page and select bitcoin. On the purchasing page, you can choose which cryptocurrency to, as well as the fiat currency you wish to transact in. 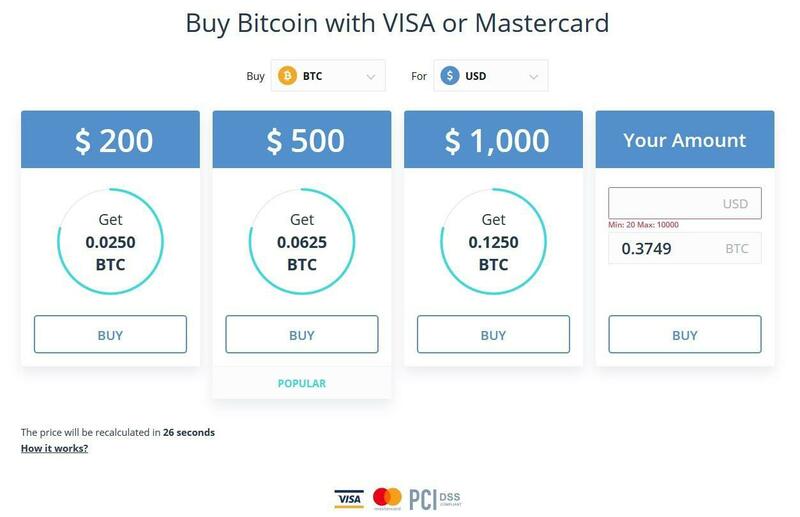 You can select from one of four preset options for quick purchases ($100, $250, $1,000, or $3,000), or use the slider below these options to choose exactly how much bitcoin you wish to purchase. 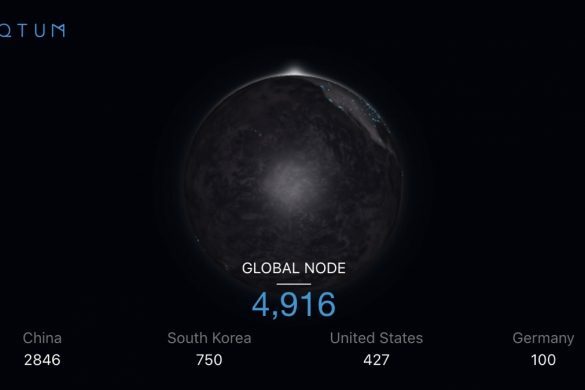 You will be able to see the amount in bitcoin as well as its equivalent in your currency of choice. Despite its slightly higher fees, Coinmama gives you a secure and fast way to purchase bitcoin and a variety of other cryptocurrencies. The platform’s quick verification process and secure user portal make it a great choice if you’re looking for simplicity and safety for your crypto needs. Paxful has quickly built a reputation as an easy and secure way to purchase and sell bitcoins for users of all skill and experience levels. The company’s platform is a peer-to-peer exchange that lets users sell their bitcoins and purchase them directly from other users, meaning Paxful itself does not need to capture your information or use any invasive verification methods. Some sellers may require additional identification, but the platform itself only requires you to open a basic account. Moreover, the company stands out because it claims to have no fees for buying bitcoin (although there is a small 1.00% surcharge for sellers). Moreover, there is no limit on how many bitcoins you can purchase in a day or a month, so you can get as much as you wish at any time. Regions Supported: All countries except those banned by the US Office of Foreign Assets Control. Getting started takes a few seconds, and all you need to do is create an account to start buying bitcoin. Registration only requires your email, your desired user name, and a password. Once you’ve completed this step, you’ll be able to view your account profile, as well as start purchasing or selling your coins. It’s important to keep in mind, however, that while Paxful itself does not require verification, specific sellers may ask for more identification based on the payment method you’ve chosen. 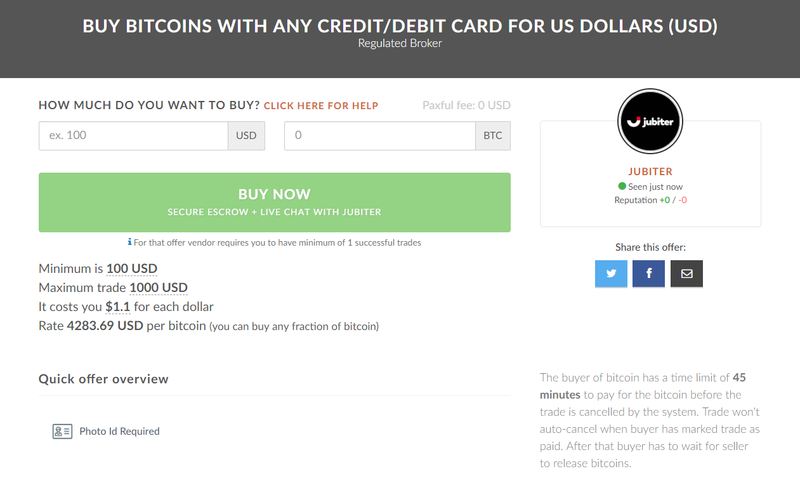 To purchase bitcoins, simply enter the amount you would like to purchase in your preferred currency and select the “ANY credit or debit card” option, followed by pressing Search. This will take you to a listing of all available sellers that match your preferences. Keep in mind that because you’re not purchasing from an exchange, but rather from other users, the price listed by each seller will vary from offer to offer. Once you select your offer, you’ll have to initiate a chat with your seller, establish the final parameters, and provide any additional details they require. When you agree, the funds are placed in escrow by Paxful, and you must complete your transfer of funds in the allotted time or your transaction will be cancelled. Paxful offers the convenience of a direct transaction with your seller, which reduces the fees attached to any sale and means you can get bitcoins at a price that works best for you. However, because the company does not guarantee transactions on its website, it’s important to be careful and conscious about the sellers you work with. Even so, the company’s no-fee guarantee and ease of use make it an ideal choice if you need to purchase bitcoin quickly. With the prices of bitcoin more accessible than they have been in several months, making a purchase and entering the market now could be beneficial. However, for users who are inexperienced in cryptocurrencies or wish to keep things simple, the option of doing so with a credit card is valuable. The exchanges presented each offer the benefit of being fast, easy to use, and friendly to beginners. However, based on your needs, some may be more optimal. To make sure you choose the right solution, it’s important to consider what factors are most important to you. Some may be fine with slightly higher fees to deal directly with a platform while others may prefer the speed and privacy that comes with a peer-to-peer system. Regardless of your choice, you can find a good option to purchase bitcoin with a credit or debit card in any of these websites.